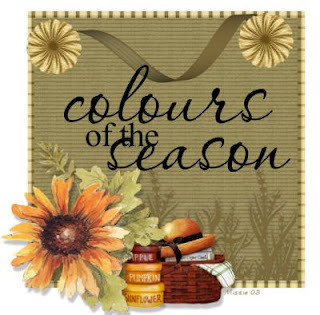 I'm ready for the "colours "of the season. I believe this graphic was made from friends across the pond! For us it is "colors". But I'll take it either way it comes. I am so ready for it. Normally the cooler air has arrived. I think it gets better next week. I got through the day yesterday without being a bear. Yay me. I did try to be quiet, focus, not complain and just get on with it. Like I said - it's just me with a mega load going and I can't multiply my efforts in any way so it will not going anywhere, it'll just be waiting and cross over into the next day (in some cases the next month, and the next year) with only priorities being handled as everything else awaits. So as I have been paid again I've used the money to order some things and all that is coming in along with my Target order. It looks like we are trying to open a retail store! lol I had fun going through and opening all the boxes. It's like Christmas. I ordered a lb of fat. For me, this is a huge conversation piece. It amazes me what losing 1 lb, 5 lbs, 10 lbs, 100 lbs looks like. It's an amazing visual. And when you start talking about removing this from around your organs like your heart and liver - this is life changing. I want others to realize this so I've paid $34 + tax for this 1 lb piece of rubberized material to make the point. So the white board came in and its easel which breaks down really small. George helped me set it up. Now I can practice the comp plan and I will also use my board to keep me focused as well. I have to figure out where to keep it on a full time basis. lol There is not much room near my desk in the corner. I'm probably going to keep the white board in the floor at my desk (off the stand) for now. So Lisa and I (and her hubby Lou) booked our trips to Phoenix for January 2019 for NYKO (New Year Kick off). I'm so excited I can't stand it. ;-) Guess how much my plane tickets were? $11.22 round trip! I had a lot of points. And the flights were cheap so we booked them now. I'm very excited. The hotel is booked as well. And I just booked the event ticket which is $199 but I had a coupon of $75 off for that. So, looking forward to getting ready for this event coming up next Saturday. And then doing what I can during our busy busy season. I want to set up a challenge for January and February. Need to do some marketing on that. We'll have a group to set up and compete for weight loss for spring - after the holidays on Facebook. Meanwhile I have to go. Running out of time! You are a busy person doing all that you do with work and home and your side job too. It's a good thing you are well organized. Hope you Saturday is a fun day! Enjoy ! glad you were able to book your flight and hotel for phoenix so early giving you a discount. the rubberized fat looks cool and will bring the point home to those who are looking.